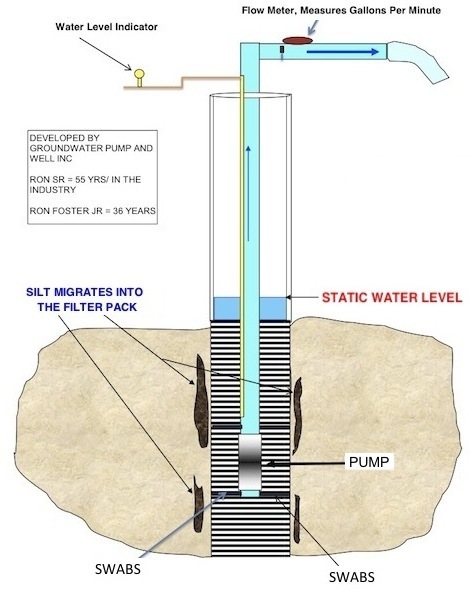 Pumpman Norcal has developed a new well-development method that works better than the old air lift methods. Previous, similar re-development tools used an air lift method, at best this will only you give you a rough idea of how you are progressing during the re-development process. Why is it so ineffective? It only provides a guess or estimate. Most specifications call for swabbing, brushing and or cleaning a well for so many “minutes per foot” of perforation, or a “prescribed number of hours”, with no mention of “Let’s Do This Job Until You See The Results You Want” The only way you will know if you have done any good, is when you re-install the permanent pump, and if the job is not complete, or not up to your expectations, it would be very costly to remove the permanent pump, and re-swab the well. Accurately Measures Your Improvement, while you are in each perforated zone. You see all of this information or data (or both) as you perform the re-development work. Ron Foster Jr has studied Groundwater Aquifers and well rehabilitation techniques for 34 years and helped design this new tool.